Of course, according to the code context, and to my previous x86 experience, the previous opcode will move the content of current Teb (thread environment block) Stack limit field, in r11 register. But how this is implemented in a X64 CPU? According to the previous picture, it seems that all x64 segments are used only for memory protection (Ring 0-3 protections). But, one important question arise: how is possible that GS segment base address is 0? It is indeed very improbable that TEB could be located at address 0x00000000. So far so good… Now it’s time to understand why FS and GS segments work in the way as they do for 64 bit long mode. The answer to the question resides in Windows X64 Syscall handler. Intel manual states that SYSCALL new instruction transfers execution control to the address found in IA32_LSTAR model specific register (and changes CPU current privilege level). IA32_LSTAR register points to “KiSystemCall64” Nt kernel routine. Whenever a native API is called from user mode, Ntdll code exploits SYSCALL instruction to perform Kernel transition. The transition is managed by “KiSystemCall64” procedure. The test driver I have developed confirms all the previous conclusions. As a matter of fact, Windows operating system, when working in 64 long mode, has GS segment that always points to current thread TEB (in user mode), whereas in kernel mode points to current processor PCR. Adding a segment descriptor, and doing some other tests, confirms again that X64 GDT is used in long mode only for memory protections. In 32 bit compatibility mode, all segments are used as normal for memory segmentation. A printable “pdf” version of this article is available here. Interesting article. You inspired me to research more on this topic. Thanks! If you would like to share with me your new research topic, it could be great! Hey! I am glad to find your post. I actually stumbled upon it while seeking an answer to the question: why is the cs register being used as if it was a kernel data structure? 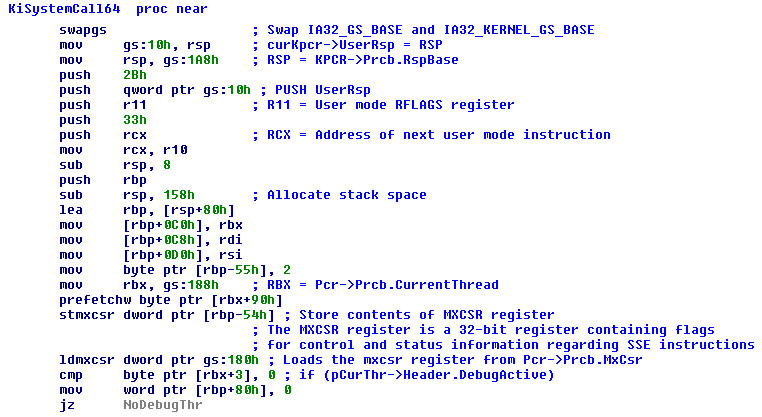 Looking upon some code from the kernel driver win32k.sys, I have seen the code refering to cs:_gptiCurrent; this seemed a bit odd, as the cs register should be used to indicate the current code section, and made me wonder. This question still remains unanwered, so if you have some insights on the matter, I’d love to hear them. This post made me revisit the topic of segmentation which I have researched a bit in the past, and made me re-think about it a bit. In my research, I have learned how Intel defines segmentation and tried to reflect upon how Windows is using it; thus, I have written a kernel mode driver which is pretty similar to the one you described in your article. The code for it is found here: https://github.com/scalys7/Windows-Kernel-Research/tree/master/Windows%20Kernel%20Research . When I revisit it and it’s execution results, and comparing to what you have described here, I found it interesting. At first glance, the results has shown that the gs register in kernel mode is at base address 0 and points onto a user mode segment. This contradicted all health logic, so I have revisited the code I wrote to print segment register values; that approved my assumption – the details printed where extracted from the corresponding GDT entry, given by the index from the selector part of the register. This makes sense, due to the following two points: 1) the instruction mov ax, gs only reads the selector part of the register and 2) the actual values used are those in the hidden part of the segment register. I later continued on gazing upon the psuedo-code (http://www.felixcloutier.com/x86/SWAPGS.html) describing the swapgs instruction, which fully resolved this anecdote; the swapgs instruction only replaces the hidden part of the gs register value. One remark on your article – It is not true to say that the swapgs instruction uses IA32_GS_Base, as you may clearly see in the psuedo-code. What I think that might have confused you, is that most likely IA32_GS_Base always holds the TEB; I do not know where it is being used, as the swapgs instruction uses Kernel_Base exclusively, but I guess that when dumping the values on user mode, you would find it to point to TEB and Kernel_Base to point onto the PCR, which makes sense. During kernel mode execution, the Kernel_Base should also point onto the TEB by the above linked code. Is there any documentation upon how Windows 32-bit uses a full segmentation model? 2) The cs register usage as described in the very beginning of this comment. First of all, thanks for having signalled this. I would like to try to answer your questions. Regarding the “CS” matter, honestly I have no idea. I am 10000% sure that the segmentation in 64-bit mode is not used, but rarely I have seen something like “mov rax, qword ptr cs:[0xADDR]”. I think that it depends on some storically motivations. I have even made the try to substitute the opcode, and I can assure that the results are still the same. The only segment register used in X64 is the GS segment. This pseudocode has been confirmed even from my tests. Hey, AaLl86, thanks for the article. I have a question. If the base address of the GS segment is just 32-bits how is it used in a 64-bit flat addressing space? I mean, how can a segment reach beyond the first 4GB of the 64-bit linear address space with just 32-bits? Or is it sign-extended to 64-bits. Which still doesn’t help the issue too much. The GS segment descriptor in 64-bit environment is always 64-bit. Are you perhaps confusing with the Segment Selector??? I meant 64-bit base address for GS register. Where does it come from if the segment descriptor has only 32-bit base?